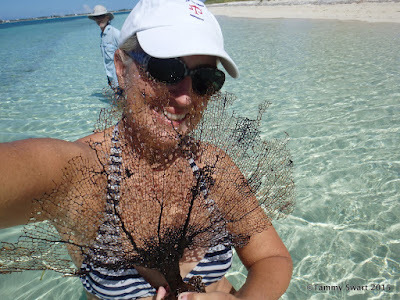 Things we did today...: Goodbye Abacos - Hello Berrys! Before we even got into the deep water leaving Sandy Point, we were fishing. The day was gorgeous with light winds and benign seas. We were just settling in when the fishing pole went ZZZZZzzzz! Too bad it was a stupid barracuda! Well it was an exciting start anyway to an otherwise uneventful crossing. We tried putting up the jib but it hung like a rag… so we just rolled it back in and motored on. I’m not even sure that the cats would have known we were under way if we hadn’t chased them out of our bedroom… They slept the entire way. I think I even got in a short snooze. Suddenly it was LAND HO! We could see Stirrup Cay and found ourselves in the land of giants! We approached the cruise ship anchorage and there was a big one parked there. I wondered if they would try to shoot us if we got too close like they do back in the US when they’re in port. I figured that this was the Bahamas and we could go wherever we wanted… then I though maybe… this is the Bahamas and they can shoot us whenever they want. 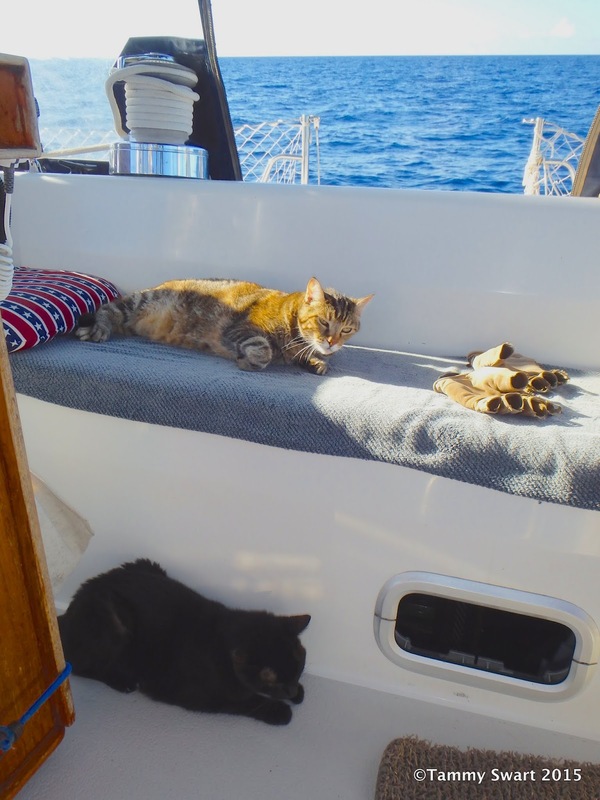 We motored on, unchallenged, right between the ship and their shore facility with no interruption… other than the catching of these two bar jacks! We weren’t sure what they were but decided to keep them and figure it out later. Bruce filleted them up while I motored us towards the anchorage outside of Great Harbour Marina basin. The best part about the place is the entrance is cut through the rock. I must say that we were disappointed with Great Harbour. We anchored off of the Bullocks Bay settlement and motored our dinghy into the very well protected basin where we visited friends who were staying at the marina there. The water was a nasty looking green. We had hoped we were leaving that behind in the Abacos. There was really nothing here. We had expected a bit more. We took a quick look at the settlement and decided not to even go ashore… The next morning, we went in to buy some fuel and we were outta there! We sailed off our anchor and set off to retrace our path back around the north end of the island to the east side. The winds were very light and we were having fun trying to trim the boat to move, but making only 3.5 to 4.5 knots… We decided there was no need to get anywhere so why not just enjoy the slow and easy sail? It was sublime. We ghosted along and relaxed, weaving in and out between two giant cruise ships. We caught another bar jack in about the same place as we had caught one on our trip in… Bruce filleted it and we added it to the others. We arrived to our next planned anchorage N25°46.150 W077°51.190) by mid afternoon. We are getting pretty good at finding our own spot and no longer depending upon the Active Captain icon to show us the way. We can read the water, watch the depth sounder and do the math depending upon where we are in the tide range to find our perfect spot. Dropping the anchor in sand was a no brainer here. There was a mile of it to choose from and we were the only boat around. A small sailboat with a colorful sail came by and it’s captain waived a greeting. They must be from one of the nearby homes lining the white sandy beach. Great Harbour had been a disappointment… but that was the marina… While we are still anchored off of Great Harbour Cay, this is a world away. Morning came and we were excited to be up and off the boat to explore. I had heard that there were caves on Sugar Beach and wanted to find them. We dinghied to the beach at it’s nearest point and then turned to motor along taking a close look at everything around us. We found what I think must be the caves… Not sure. But they look kind of like what I saw in the internet search I did… Unfortunately, even with the light winds there was a little too much surge for us to land the dinghy safely. I really don’t think Bruce was into it anyway, so we took off across the Bay to check out Petite Cay. With the obvious entertainments of this Cay finally exhausted, we sped over to Little Petite Cay to see if we could find a snorkel spot. We kept our eye on the thunder-boomers looming in the distance, but it didn't look like we were in their pathway as we approached the tiny beach. What had appeared to be a great place to snorkel from a distance, turned out to be less inviting upon closer inspection. 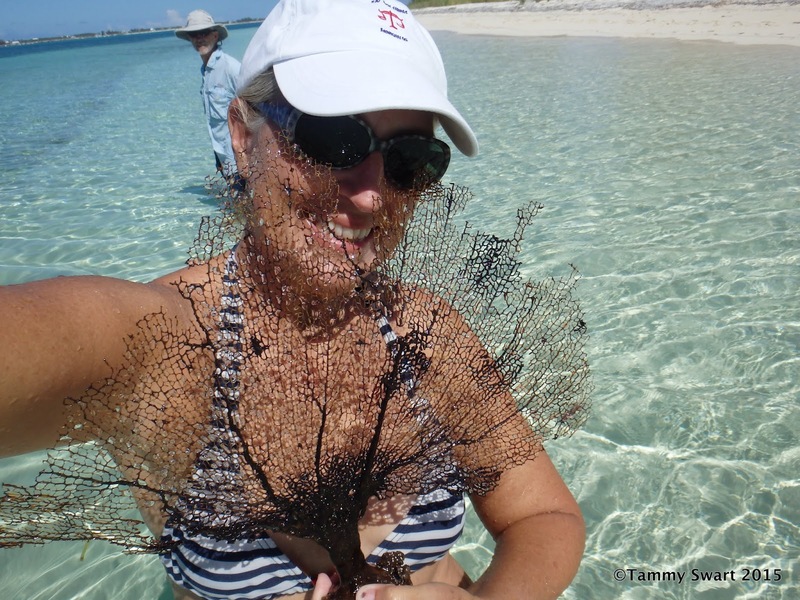 I set to beach combing and found this cay to be one of the most shell-laden we've found in the entire Bahamas. So while Bruce scoped out the water... I collected shells and marveled at the other wonders hiding on this tiny cay. Crab races... not a photo finish! We found some movers and shakers of the crab community and put them to the test. We drew a circle in the sand and had an impromptu crab race. I chose my crab when she won! After all of that adrenaline, the snorkeling fell a little short, but we took a swim around the corner and found a few things of interest under-the-sea. This is a nursery where tiny fishes of all sorts were found. Well, after the unexpectedly civilized Abacos... the Berrys are turning out to be everything we had expected the Bahamas to be... remote beaches, unspoiled beauty and fascinating creatures. We are really feeling the finality of being here. After this, it's back to the US. We plan to stretch it out for as long as the calendar will allow. Oh so love your posts and updates. Oh Richard, I think you're our biggest fan! It's nice to have you out there along for the ride!